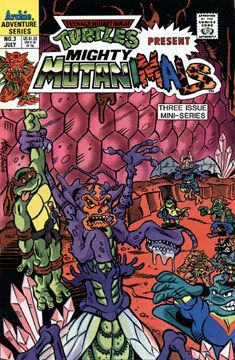 On Earth, the Mutanimals rush into battle against the alien invaders while Raph and Mondo are being dipped in honey sauce on Malgina’s ship so they can be eaten later. The Mutanimals do a good job of defeating the enemy, but as things look good, Maligna’s mothership arrives on the scene and jettisons hundreds of small warships from its hull. Skul and Bean also arrive and begin attacking our heroes. Raph and Mondo have been paralyzed by the poison in the honey sauce and are unable to battle their foes. As the two despair over the situation, they hear two gun shots, and the insect warriors that were basting them fall to the floor. Kid Terra arrives, his six-guns smoking. The cowboy helps the mutants wipe the sauce off of their bodies and they quickly regain their mobility. The three head off to face Maligna. By now, Maligna’s ships have covered the entire planet and are attacking – things look pretty bleak for planet Earth. Fortunately, back onboard the hive mothership, Kid Terra fires a shot that severs one of Maligna’s antennae (which she uses to control her forces). Raph tells the queen to call her minions back, or Terra will finish her off. Desperate to maintain her armies and save her life, Maligna does as she’s ordered. The warships all dock back inside the mothership. Terra holds his gun to Maligna’s head and Raph makes her promise to leave the Earth forever. Our heroes make their exit and Maligna and her minions fly back to outer space. Kid Terra tries to apologize to Ray Fillet for killing Bubbla the Glublub (TMNT Adventures #16), but Ray isn’t in a forgiving mood. The Mutanimals build another campfire and rest, while we see Null skulking off into the jungle.